Belgium and, specifically, Ghent. 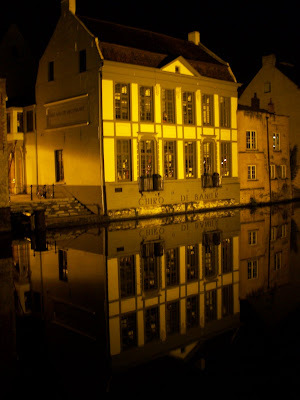 Located in Dutch-speaking Flanders in the north of Belgium, Ghent has a charm all its own. 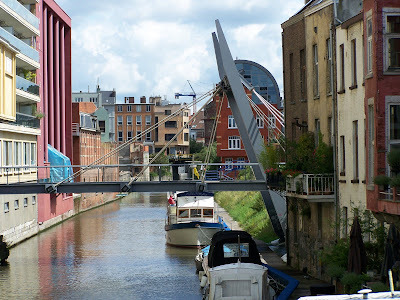 Canals wind between buildings old and new. Thanks to living in London and being not a million miles away from a Eurostar terminal, it's relatively easy for us to hop onto a train and, a couple of hours later, hop off into a different world. My Dutch (Flemish) is limited to the usual courtesies and being able to navigate through a menu. Well, sort of navigate. I have eaten some interesting things. Last summer we were over there for a few days and found a lovely little cafe for lunch. 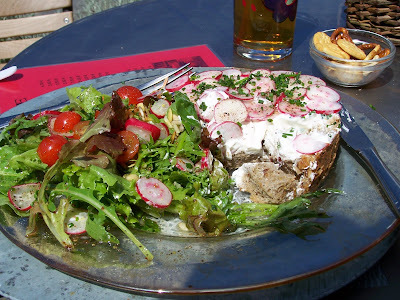 I thought the bread & cheese with salad and radishes sounded just the thing. There was bread. Good, hearty, stoneground wholemeal bread. And cheese. Copious quantities of fromage blanc, making the bread soggy. Not quite so good. And there were radishes. Numerous radishes. Neatly sliced and laid in overlapping layers, making pretty patterns on the cheese. It was interesting. Mr A made little snorting noises into his fish soup. I took a picture. But what's a bit of indigestion between friends when you can take a romantic stroll by the canal at night? Dennis says his humans went to Flanders and ate waffles. and crepes. The waffles and crepes in Flanders are wonderful. Much, much better than the radishes! I'd still have enjoyed that sandwich, given the surroundings! Good Lord. That's a lot of radishes! 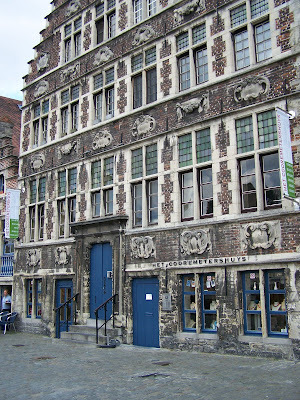 i want to go to ghent!